1. The Swissmemory! 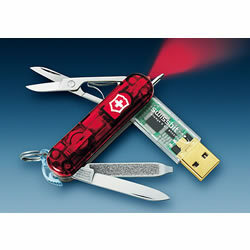 A swiss army knife with a USB drive (64 or 128K, so far). Ahooooooooooooooooooooooooooga! Santa, please! 2.Kevin Smith is making a sequel to Clerks! I liked Jersey Girl, but I freakin loved Clerks. No shame in turning back to your roots, Kev! Yeah, baby! I'm not even supposed to be here today!!!!!!!!!!!!!!!!!!!!!!!!! !